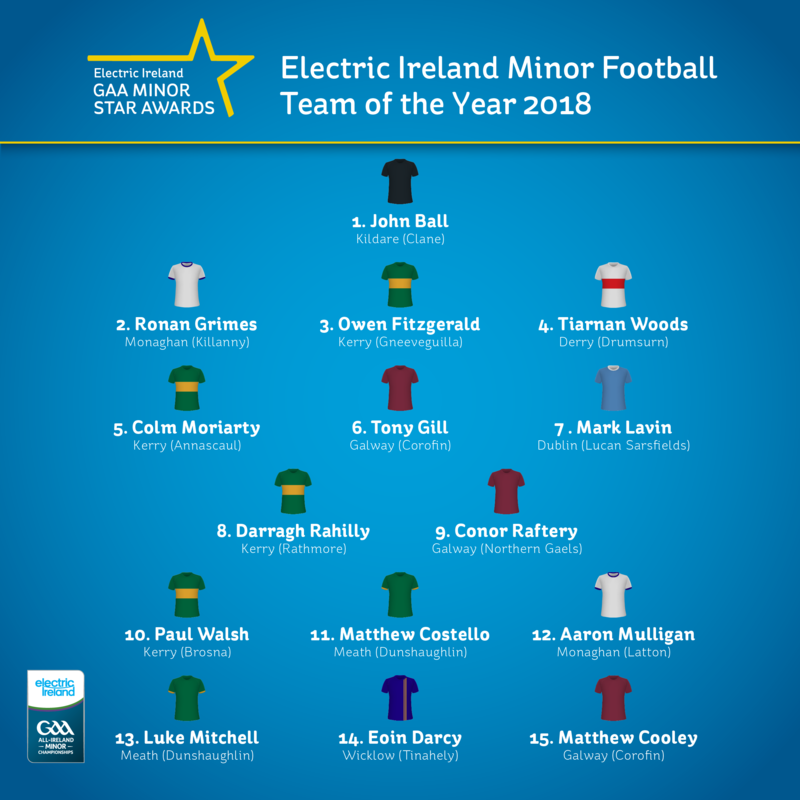 The 2018 Electric Ireland Minor Football Team of the Year has been named, ahead of the second-annual GAA Minor Star Awards. The 2018 Electric Ireland GAA Minor Football Championship ended in dramatic fashion this year, with Kerry staging a fantastic comeback in the final to overcome Galway and defend their crown. It was the Kingdom's fifth Tom Markham Cup triumph in a row, an unprecedented achievement. Across every week of the 2018 season, we here at Balls have been profiling the best performances in the 2018 Electric Ireland GAA Minor Football Championship, so the names on this Team of the Year sheet will be familiar to our readers. The fifteen young players were selected by the All-Star voting panel of Sean Cavanagh and Daniel Goulding. Picking the fifteen best minor footballers in the country was especially difficult this season, as there was so much quality on display. In total eight counties have been represented. Champions Kerry are unsurprisingly the most heavily featured, with four players present. All-Ireland finalists Galway have had three players selected, with Leinster champions Meath and Ulster champions Monaghan each having two. The Minor Star Awards will take place in Croke Park on September 29th where the overall Football Player of the Year will be announced. Stay tuned as next Wednesday 19th Sept we’ll be announcing the Hurling Team of the Year. The Electric Ireland Minor Star Awards take place at the end of September, for more information, interviews and videos follow the conversation at #GAAThisIsMajor and on the Electric Ireland's Facebook page.